featuring dream scenarios expressed in both artworks and texts. Patricia Fiorent’s installation films involve all the medias she is working with, and become a place where her personal texts meet with her visual art. The installation films released on Vimeo are based on her recent book called Boundaries, a work of fiction. After years of writing Patricia has decided to forge her writings with her art. She started filming her books in black and white, performing oneself in the films, exhibiting a visual based on her texts; a film–noir experience. The films feature both dialogues and extracts from her book, revealing tense scenes and personal dialogues. Even though only extracts, they form a world of their own, and stand out as detached works of art in their own right. She acts the scenes based on her own world within– a highly personal level of expression, inviting us into one woman’s head and vision– featuring images of a woman captured in various provocative and psychological and physical states– each with a common denominator – the artist herself. 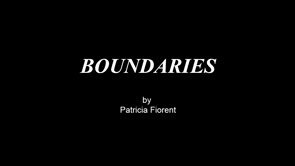 Patricia Fiorent chooses to act out her scenes herself and tears down the boundaries between writer and spectator. She captures herself in a range of guises and personas in curiously indeterminate narratives which are both disturbing and affecting. 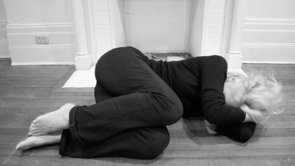 The black and white theme renders it even more emotionally detached or heightened even; cropping, space, eye contact (or lack of it) is continually stated and restated. The effect is not simply didactic. Her work documents the ability of an artist to perform, create, document, question and invites a host of engaging and provocative dialogues within a three dimensional quietude. Patricia describes the process as intuitive and that she responds to elements of a setting such as light and mood and explores different scenarios as a director of film. She herself has commented on this process. “I think of becoming a different person. I look into a mirror next to the camera. By staring into it I try become that character through the lens. When I see what I want, my intuition takes over – both in the acting in the editing. Seeing the other person that is up there, that is what I want.” The staging and self-editing illustrates the range that both the actress and the artist maintain – a sense of integrity. Her imagery has evolved through sources including cinema, TV, magazines, the internet and art references. Her visualisations explore a contemporary identity and the nature of self. As her own muse, Patricia’s credits include editor, writer, author of scenes, model actor and stylist. The intrigue thus being who exactly are we seeing, what are we seeing, and it is precisely, this curiosity that continues to sustain our gaze. This is the official home page of Patricia Fiorent. © September 1973–April 2019. All rights reserved.